The Chemical Guys Heavy Clay Bar is the safest and most effective way to remove contamination from your vehicle’s paintwork. Flex-Clay Technology easily removes years of heavy overspray, rail dust, brake dust, pollution and contamination for a smooth-as-glass feel. The unique elastic black detailing clay pulls off heavy and rough contamination like a magnet. 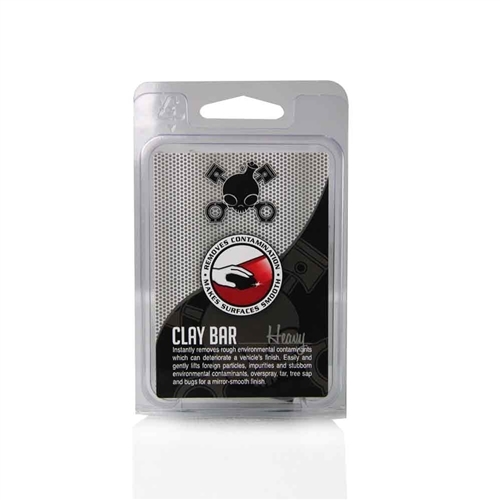 The advanced Heavy Clay Bar is designed to cleanse vehicles with years of stubborn contamination and pollution. The Heavy Clay Bar works great on paintwork, glass, plastic and metal surfaces. Detailing clay bar safely removes overspray and pollution without damaging the surface. The Chemical Guys Heavy Clay Bar is the perfect choice for removing embedded contamination from new and old vehicles. The Heavy Black Clay Bar is the safest way to cleanse virtually any painted surface. Great for removing contamination before applying your favorite coat of carnauba wax or paintwork sealant. The Chemical Guys Heavy Clay Bar is non-abrasive and safe on aluminum, chrome, fiberglass and all painted surfaces. Restore the smooth feel back to any car, truck, motorcycle, RV and boat with the Chemical Guys Heavy Clay Bar. The Heavy Clay Bar is the perfect choice to remove the heaviest contamination from older vehicles. The non-abrasive detailing clay restores the smooth-as-glass feel to virtually any exterior surface. We designed the Heavy Clay Bar to gently cleanse the surface of stubborn contamination for a perfect finish. The Chemical Guys Heavy Clay Bar works great on paintwork, plastic, wheels, glass, metalwork and fiberglass. Perfect for cleaning specialty carbon fiber and Kevlar surfaces. The Heavy Clay Bar works best with Chemical Guys Luber for the ultimate clay bar experience. Simple spray Luber directly onto the surface and cleanse the panel using the Medium Clay Bar. 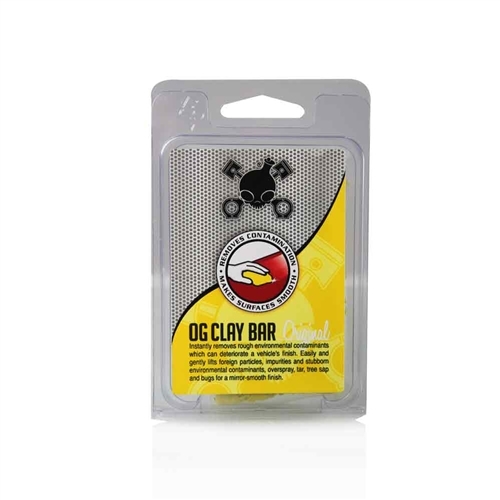 The Chemical Guys Heavy Clay Bar easily removes the roughest contamination while being safe on the surface. Great for restoring a smooth finish on vehicles 10+ years old. Quickly remove tree sap and road tar for a perfectly clean finish. Easily remove pollution film and overspray from your vehicle’s glass for improved visibility. The Heavy Clay Bar creates a mirror finish in minutes. Contamination and overspray can ruin the shine of your vehicle’s finish. The Chemical Guys Heavy Clay Bar easily removes years of embedded contamination. The non-abrasive detailing clay is the perfect choice for removing stubborn overspray, rail dust, pollution, brake dust, water spots, road tar, tree sap, bird droppings and mineral deposits from virtually any exterior surface. The Heavy Clay Bar is designed to clean older vehicles to restore the surface. The innovative elastic detailing clay is safe and effective on any color paintwork. The Chemical Guys Heavy Clay Bar even works great on plastic headlights and taillights. The Flex Clay is flexible to clean the tightest spaces. Restore the smooth feel back to any car, truck, motorcycle, boat and RV. Remove embedded brake dust from wheels and rims for a mirror shine. Detailing Flex Clay is a major step to keeping your vehicle looking amazing. Chemical Guys Heavy Clay Bar makes virtually any surface feel smooth-as-glass. What Can Contaminate Your Vehicle's Surface? 1. Brake Dust - Particles produced from the friction of brake pads rubbing against the rotor. This metal on metal friction disperses tiny particles of bare metal into the air and on the highways and virtually everywhere your car travels. Constant movement of vehicles propels it into the air and dispenses it over the vehicle's surface. 2. Industrial Fallout - Another word for pollution, industrial fallout is a by-product of our surroundings. It comes from industrial businesses and factories as well as diesel vehicles and includes even airplane fallout. 3. Rail Dust - Produced from the friction of train wheels against railroad tracks. Over 75% of new vehicles are shipped by rail. Nearly all new vehicles are contaminated as soon as they leave the factory. When Should You Clay Bar? You can clay bar your car as often as you wish or simply prior to waxing or polishing your vehicle. To acquire the best smooth as glass touch and feel result it is ideal to always clay bar your vehicle prior to application of wax, glaze, polish or paint sealant. 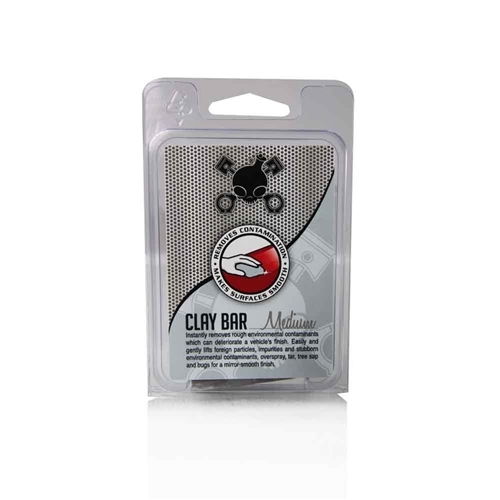 Many people have never heard of clay baring because for a while clay bars were only available to professionals. Claying is less abrasive then polishing or buffing the surface. Claying actually pulls out foreign particles and contaminants that have embedded themselves in the paint. Polishes are intended more to be used as cleaners for paint, such as cleaning the paint, filling swirls and scratches, restoring and maximizing shine by smoothing over sharp edges. How is clay different from polishing or buffing? Many people have never heard of clay barring because for awhile clay bars were only available to professionals. Claying is less abrasive than polishing or buffing the surface. Claying actually pulls out foreign particles and contaminants that have embedded themselves in the paint. Polishes are intended more to be used as cleaners for paint, such as cleaning the paint, filling swirls and scratches, restoring and maximizing shine by smoothing over sharp edges. Do I need a clay lubricant? Yes! Clay bars absolutely need some kind of lubricant to work correctly. Without lubricant, clay bars cannot move freely over the surface and work as intended. Without proper lubrication a clay bar will catch on contaminants, pull them across the surface and possibly scratch or mar paint. 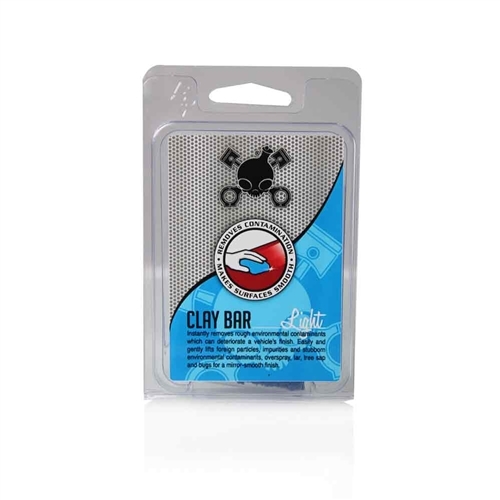 Clay bars are such intended as to work with proper clay bar lubricants are formulated to lubricate the surface allowing the clay bars to glide more freely across a surface. Lubricants aid the clay bar in lifting particles and allow the clay bar to move freely from raking roughly across the paint and causing possible scratches. Can you use soap as a lubricant? No! Lubricants are formulated to work with the clay bar and will not impact the integrity and cleaning ability of a clay bar. Shampoos and car wash soaps may damage the clay bar leading to deterioration, which in turn will limits its cleaning ability and shorten its life span. Specially formulated clay lubricants are formulated with uniquely engineered surface lubricants to allow for superior gliding of the clay bar and provide a slippery protective layer that clay bars can safely glide across.